What if you can share temporary access to your guests or service people? How can I control my lock when I am away? Want to be notified when you kids return home? Ultraloq Combo is a revolutionary smart lock that offers entry via biometric fingerprint identification, contactless key fob, or your Bluetooth enabled smartphone. With 2-Point locking and One-Touch-Unlocking feature, it brings security and simplicity together. The Bridge upgrade allows you to share an eKey with guests while you're away from your home and monitor all activity via the iOS or Android app. It features two-point locking - one on the deadbolt and one on the handle, That keeps your home twice as secure. The fingerprint sensor is thoughtfully positioned to accompany your natural hand positions. With our patented technology one seamless action allows you to wake the sensor, read your fingerprint and unlock two locks. It works in the same way if you use smartphone or key fob to unlock. Automatically unlocks when the interior lever is turned down. This feature can also be disabled if you have a big dog. For those who don't want to use smartphone or fingerprint, UL1 can be unlocked with a contactless key fob. Once you present the key fob in the vicinity of handle, the door will instantly unlock. Ideal for kids and the elderly. Grant access for specific dates or times. Ultraloq App enables you to unlock your door with your smartphone. Knows who has the access to your lock and how. Add or delete users any time you want. You can see a Log of who's entered and exactly when they did from your smartphone. Control entry access to your door from anywhere, for anyone with the optional Bridge. You can unlock your Ultraloq or grant access to guests and visitors via an eKey for specific dates or periods of time remotely with no monthly charges. You will receive a smartphone notification when someone opens your door. To ensure that you're never locked out because of a dead battery, the lever operates on a dual battery system as well as sends your phone warnings if the battery is low. Thank to Bluetooth 4.0's ultra low power consumption technology, Ultraloq can be powered by four AA batteries with more than one year of battery life through regular use. Ultraloq Combo is thoughtfully crafted with style and functionality in mind. The handle looks clean and compact on any door with smooth surfaces, curved edges, and narrow size. While the main function of Combo is safety, we wanted to create a lock that brings usability, simplicity and elegance together. Ultraloq Combo is designed to fit any US standard door. The simple installation takes minutes and only few screws. No wiring and no drilling. The lever is reversible for both left handed and right handed doors. Just ask Amazon Echo or Google Home to control your Ultraloq. You can also integrate seamlessly with popular smart home devices using IFTTT functions. With Ultraloq Combo, you never have to leave work to let in the maintenance worker or your dog walker. Bridge lets you grant access to guests, the babysitter, or a service provider from anywhere for any amount of time. Never worry about fumbling around for your keys again. Ultraloq is completely keyless, so you don't have to worry about carrying anything with you. Go for a run without keys? Your fingerprint is your key so you don’t need to carry anything. Did kids get home safely? With Bridge, Ultraloq Combo can send notifications directly to your phone if someone opens your door. See who it is and how they opened the lock for ultimate safety and peace of mind. Now you know whenever your children arrive home. Deadbolt and latch provides you with heavy duty dual security. Deadbolt automatically unlocks after lever is unlocked. Deadbolt automatically unlocks when the interior lever is turned down. Your smartphone is now your key. Just unlock your door using the U-tec App on your smartphone. Just need "One Touch" to wakeup the sensor, unlock and turn the handle in no time. 13.56MHz frequency Smart Technology. Perfect for people like kids and elderly who don't use a smartphone. 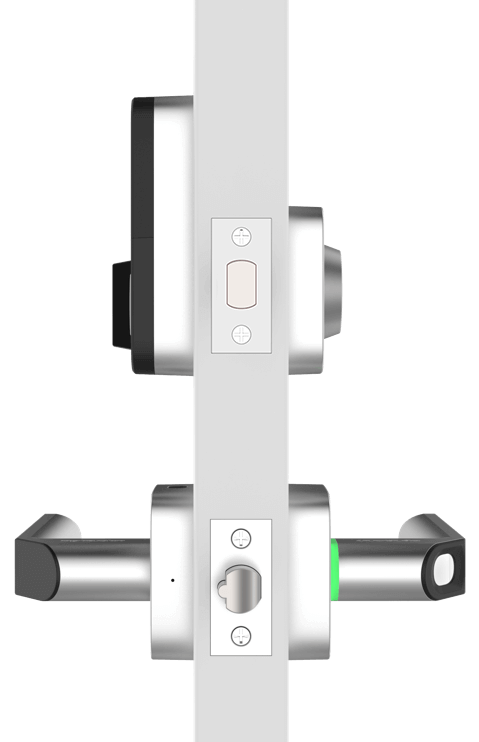 Lever is powered by 2 sets of 2 AA batteries separately. You can just replace 2 batteries form exterior handle in case battery runs out. Wireless connection between lever and deadbolt. No wiring required. No drilling for American standard doors. Durable Zinc alloy casing. Built for both exterior and interior doors. Auto relock, privacy lockout and free passage. Shows you authorised or denied access, Bluetooth connectivity status, battery and locking status.